Beans are so easy to get started they're often used in kids' science experiments on germination and plant growth. Beans are not heavy feeders, and instead rely on warmth and sunlight to flourish. In order to grow really strong, high-yield beans, however, they need rich, very well-drained soil and some extra fertilizer to encourage flowering and seed production. To give your beans the best start in life, plant the seeds directly in the garden in soil with aged compost or aged manure mixed in. These amendments contain a healthy balance of the nutrients beans need, such as phosphorus, potassium and calcium, as well as micronutrients like iron and zinc. All plants need nitrogen to encourage healthy photosynthesis and vigorous leaf growth. Beans, like other legumes, are nitrogen fixers, which means they take their nitrogen from the air and add it to the soil. This means that it is not necessary to fertilize beans with extra nitrogen. When you buy your bean seeds, consider seeds that have been inoculated with Rhizobium bacteria. According to Colorado State University Extension Service, this bacteria has a symbiotic relationship with beans that helps take in atmospheric nitrogen at the roots. Legumes have an additional advantage of enriching the soil with nitrogen for future seasons. Phosphorus is required by plants because it supports photosynthesis and increases blooming and seed growth. 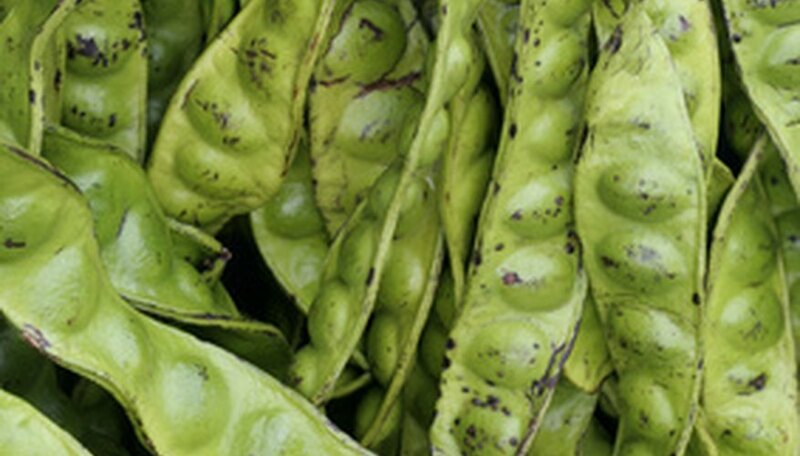 If your bean plants are growing slowly or have leathery leaves with purplish tips, this could indicate a phosphorus deficiency, according to the North Carolina Department of Agriculture and Consumer Services. Give bean plants a phosphorus boost before they have started blooming by sprinkling some bone meal along the plants' bases and watering it in. Plants need potassium for producing healthy, plump seeds and increased disease resistance. If your beans plants are starting to look a little yellow, a dose of kelp meal should help bring them back. Kelp meal is a rich source of potassium, and also contains a good balance of other helpful micronutrients. Mix kelp meal into the soil, or apply it directly to leaves in a foliar spray. Colorado State University Extension Service describes zinc deficiency in plants as yellowing on the top leaves and browning near the bottom, with overall stunted growth. Increase the amount of zinc in your soil by adding some aged compost, or add zinc sulfate into the soil or as a foliar spray.